I think Gail may have a new favorite restaurant. Last night, I thought we were going to dinner and the theater (Compulsion, at Berkeley Rep) but found out at 5:30 that I had the wrong date in mind–we’re going next week. Besides looking/feeling pretty foolish, I now had to figure out a plan for dinner. This 30 seat eatery is decorated in a strange amalgam of mid-eastern pillows, whorehouse red lamps and modern wood and metal. It’s a long, narrow space with an open kitchen, sharing restrooms with the taqueria next door. The overall effect is, well, too strange to put into words. I guess it’s sort of OK, but it wouldn’t be my first, or third, or seventh choice of decor. The menu is pretty interesting–classic American comfort food, updated in a modern style. It aims to be the best of both worlds, and pretty much succeeds. 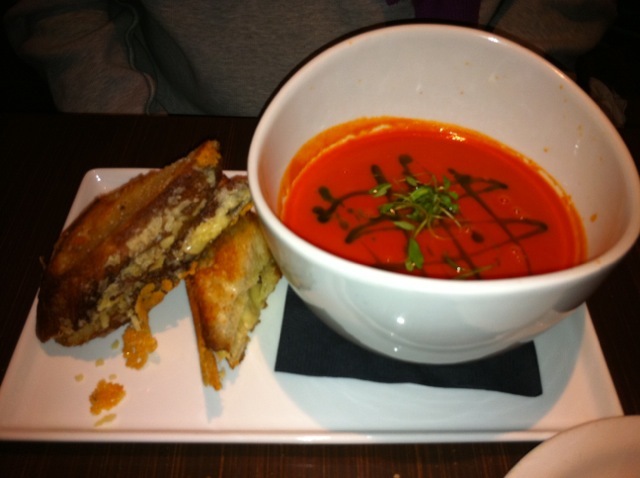 Gail started with the tomato soup and grilled cheese. This is a first course that would easily be an entrée. The soup was fresh and bright, nicely spiced and worlds apart from Campbells. The “mini” grilled cheese was excellent, on crusty french bread with high quality cheddar, not the plastic “cheese food” so often employed. We may all have an emotional relationship to tomato soup; it reminds us of childhood and cold weather and getting over being sick staying home with mom. To see it re-imagined this way is just delightful, and we’ll be going back to have it again. I had the Pumpkin soup–thick, rich and wonderful. The bowls are enormous–the soup and a salad would be plenty for dinner. Next up, Gail had the Chicken Pot Pie–she ate every bit of it, but wished that it had crust on the bottom and sides, not just the top. I enjoyed the olive-oil poached Halibut, with butter beans and gypsy peppers. My halibut was perhaps somewhat over done, but the beans and peppers were splendid. Like too many overly cool restaurants these days, the iced tea was some fancy, strange, ethereal, not-really-tea concoction. On the good side, the waitress managed to make me a glass of real tea and ice it. The bill was reasonable–the only expensive thing was my halibut. Gail had a decent prosecco from the wine list. Naturally, they are all about organic, sustainable, local, yada yada yada. SR24 (which always makes me think of Susan Rowley. I wonder if she’s had 23 other restaurants?) is an interesting place for a simple, excellent dinner at a reasonable price. Give it a try.